I’m still steaming about what President Trump said about immigrants. I’m not talking about the blatantly racist, un-American desire to exclude those from countries that just happen to be home to black people. No, I’m talking about his stated preference for immigrants from Norway. It’s not that Norwegians are overwhelmingly white. It’s that Norwegians are proud, self-acknowledged socialists, for cripessake! They have the audacity to expect their government to provide a safety net for the poor, the sick and the less fortunate, not just corporate welfare for millionaires and billionaires. And they have the temerity, the unmitigated gall, to believe that their system of democratic socialism and the social cohesion it promotes has something to do with the fact that Norwegians are among the healthiest, happiest people on earth. Trump wants more of these people to invade the United States, with their blond hair, empathetic decency and Utopian ideals of true equality of peoples and opportunities? It’s all true, then. The president has truly lost his mind. If the president had his way, Marie Mathieu wouldn’t have been allowed to come here from Haiti and to eventually bring her five older kids here, too. Marie Mathieu settled in Miami, where her youngest child, Fred, was born 21 years ago. Marie Mathieu’s husband was a teacher and she was a, well, she was everything and anything her kids needed her to be. She sold stuff at flea markets. She cleaned houses. She worked as a nanny. In late 2014, Fred was a senior in high school, on the wrestling team and working two jobs, when his mom was diagnosed with pancreatic cancer. Within three months, she was dead at 53. But before she died, Marie Mathieu told her son she wanted him to go to college. She wanted him to get the education he could use to help not just himself but other people. His wrestling coach, Miguel Dominguez, finally figured out Fred was missing some practices because he was working more hours to help his siblings after Marie died. Dominguez put Fred in touch with a kind guidance counselor named Jeannie Harper. Jeannie steered Fred Mathieu toward Regis College in Weston, which gave him a great financial aid package, and he’s been there for three years. Fred Mathieu is the pope of Regis College. He’s on the track team. He’s president of the student government. 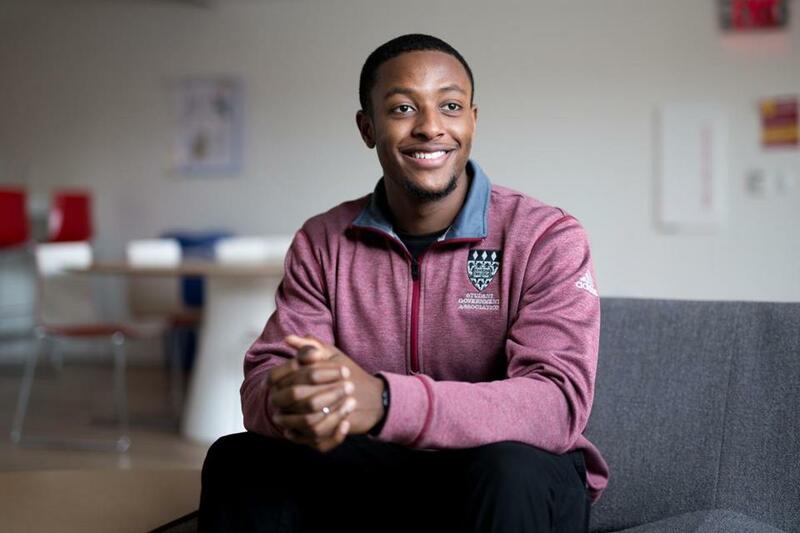 On Monday, the holiday in honor of a man who longed for a day when people would be judged not by the color of their skin but the content of their character, Fred Mathieu, a resident assistant, was helping kids move in to their dorms at Regis. And, somehow, he finds time to work three part-time jobs. He will graduate in May, a year early. He wants to get his master’s and a doctorate after that. He wants to eventually work for a non-profit that advocates for good health care for people, no matter their income, no matter their zip code. Fred Mathieu said President Trump’s attitudes about entire countries, deeming all from them undesirable, hurt him, to his core. Carried to their logical conclusion, those attitudes mean Marie Mathieu would never have come here, and Fred wouldn’t have been born here. I see Fred Mathieu. I see his ambition, his humility, his work ethic, his optimism, his infectious decency, and the greatest compliment I can pay him is to say that he is his mother’s son. And it goes without saying that Fred Mathieu, the president of the Regis College student government, is a better American than the president of the United States could ever be.